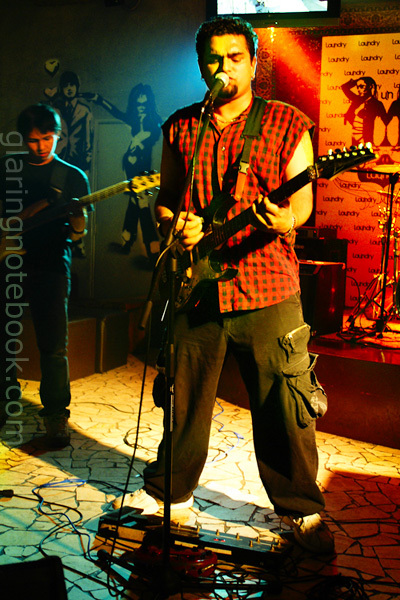 Here is a picture of Rithan of Deja Voodoo Spells, amazing shredder heavy metal band. Notice that in the background, the red spotlight has blown out, turning everything a flat shade of red! Open the above image in Photoshop. What we will do, is use the color channels to restore tones in the blown-out area. Press CTRL+1 to see the red channel. Then press CTRL+2 to see the green channel. Press CTRL+3 to see the blue channel. Repeat until you can see the difference between channels. The red channel has a lot of blown-out white, while the green channel has some shades of gray. The blue channel is pretty dark. We’re not going to bother with the blue channel. Finally, press CTRL+~ to return to the full RGB view. Now, let’s duplicate the layer. On the keyboard we press CTRL+J. Press CTRL+1 again to view the red channel. Press CTRL+A and then CTRL+C to copy the red channel to the clipboard. Then, we add a layer mask. Click on where I’ve circled in green. Now, we hold down the ALT key while clicking on the layer mask (don’t click on the text). The picture should appear white if you have done this correctly. 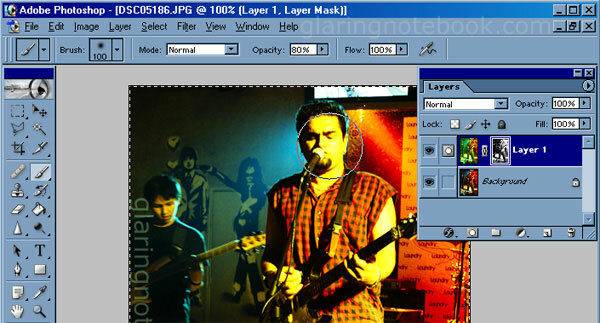 Press CTRL+V to paste the red channel into the layer mask. Press CTRL+2 to adjust the green channel. Pull the middle slider to the left and watch the tones get restored in the blown-out parts! Pull the right-most slider to the left also as you like. Ignore that Rithan’s face has turned a flat, blown-out yellow. We will fix that in the next step. 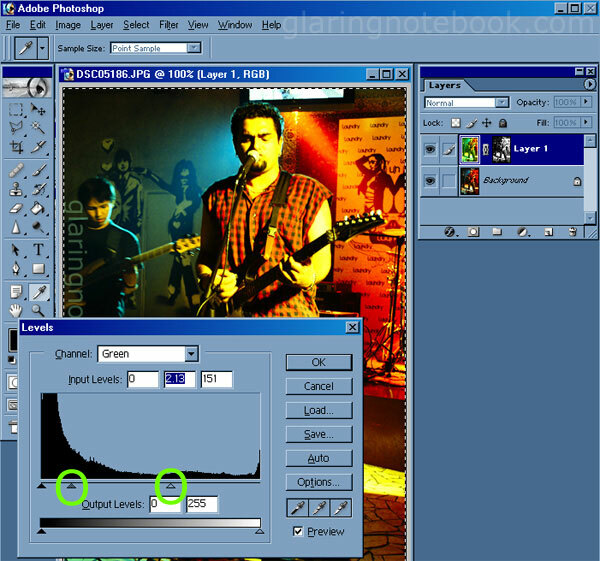 Click on the layer mask. (Do not hold down ALT while clicking.) Use the Brush tool to paint either black or white on the layer mask. If you’ve accidentally painted over some part you didn’t intend to, just hit X to invert your brush and paint over it again, to revert. Now we’ve restored the tones in his face (and kept the red in his shirt). 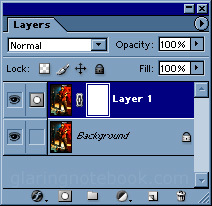 You could change the new layer’s overlay mode to Luminosity for a different look. 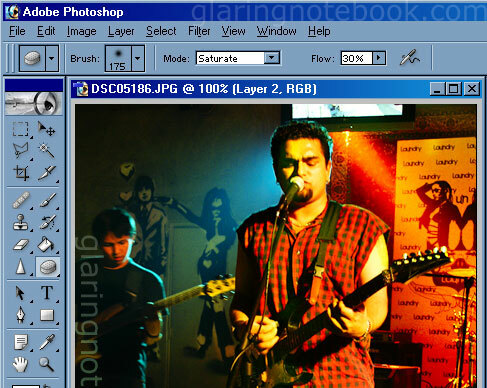 Press CTRL+E to flatten the image, and add a bit of saturation (as you like) using the Sponge tool. Here’s the finished image. Note that I used the layer mask to restore the original floor tones as the new floor was blown out. 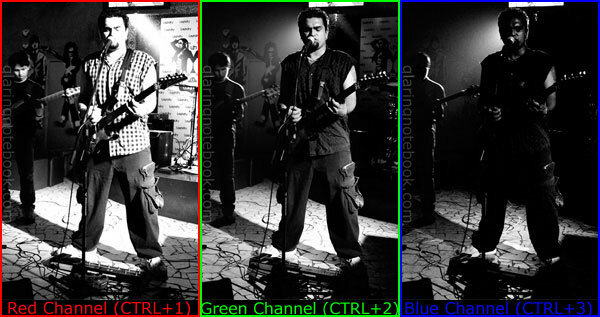 This should work for all blown-out colors – just pick the appropriate channels. This entry was posted in Geek, Pictures on August 22, 2009 by 2konbla.